100% Natural Deodorant Commercial deodorants and antiperspirants contain Aluminum Zirconium Tetrachlorohydex and many other questionable chemicals, which many believe may be linked to several health problems. These ingredients block the sweat glands which keeps toxins from escaping. This natural deodorant is an effective alternative. I�ve developed this product with Coconut Oil, Baking Soda, Cornstarch, Arrowroot, Shea Butter, Magnesium Oil, Tea Tree Oil and Lavender Essential Oil. It is not an antiperspirant, but a powerful deodorant with moisture absorbing properties. Goes on dry, won�t stain clothing, lightly scented. With skin-loving ingredients, your underarms will look as great as they feel after just a short time. Note: Occasionally people who have been using antiperspirants will find it take a week or so to detoxify the area. This too shall pass. I personally had no problem. Once past this point you will love being chemical free! Available in lightly scented lavender or unscented 2 oz. solid stick. 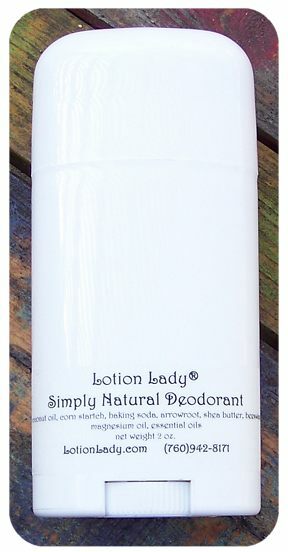 Also available as Simply Natural Unscented Deodorant.